SIDEBAR: Part of Randy is a data geek, with good reason. He wants evidence that a marketing tactic works or doesn’t; clients do too! That includes email and other digital marketing. Yes, creativity is critical and “content is King,” but data greatly helps you make the critical decisions about marketing strategies. DEFINITIONS: An Open is when somebody views the entire content of the email, not just a short introduction in a list of emails. A Click is when someone clicks on a link within the email, indicating interest in that subject. You can see the greatest impact was in 2-4 days, but it took up to 11 days to achieve full Open and Click rates before activity stopped. Kind of surprising isn’t it? We’ve also got here some Infographic data gathered by MarketingProfs.com. 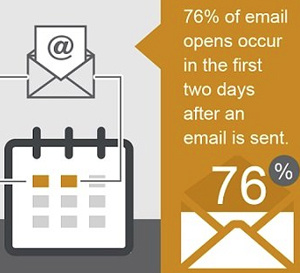 It confirms our data, but looks at it in a slightly different way: 76% of emails are opened within 2 days. We were particularly happy with these Open and Click rates being this high. 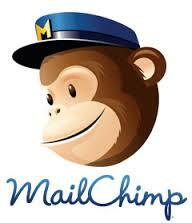 4) we carefully plan the content of each newsletter for this warm, targeted market. What is the best time to send your e-newsletter campaign? Lets talk about your digital marketing efforts for your business in 2015. 412-322-9720.